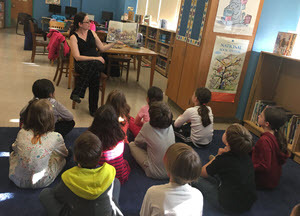 You probably know intuitively what a precious resource the library represents to our community, but you may not know that New York City doesn’t provide elementary schools with the funds required for a library, let alone a librarian. The Family Giving campaign is what pays for it all. 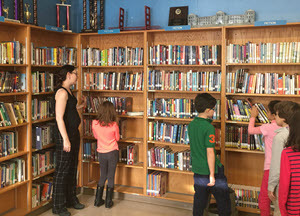 PS166’s library touches every single student, and impacts their education in countless ways. Weekly visits to the library offer a passport to literature, history, narrative, art, and culture. Book-borrowing privileges give each student a chance to discover individual passions and develop unique interests. 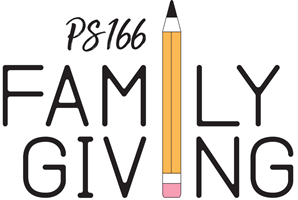 Participating in the Family Giving campaign helps sustain the vital resources only a fully functioning library can provide. This is what you make possible. Rachel is a native New Yorker who grew up on the Lower East Side and attended public school from pre-K through 12th grade. She has two daughters, ages 12 and 9 — both of them in public school. After practicing law for 10 years, she realized that her real passion was for matching the right child with the right book. She loves board games and baking and takes piano lessons. Rachel owns way more children’s books than adult books. Some of her favorite picture books are Dogger by Shirley Hughes, Ruby’s Wishby Shirin Yim Bridges, and Bea and Mr. Jones by Amy Schwartz. Some of her favorite chapter books are the Ramona books by Beverly Cleary, When You Reach Meby Rebecca Stead, and books by Grace Lin. She blogs about children’s books here. —All donations are tax-deductible to the fullest extent allowable by law. —Gifts can be made in recurring monthly payments. Your support makes a crucial difference for all of our children. Library classes are up and running! Our kids are have been enjoying the new books and read-alouds. We’re looking forward to a great year exploring the shelves together. If you are interested in helping as a parent volunteer as part of the Learning Leaders, please contact our librarian. Book Return Policy… Just a reminder, students may check out one book at a time. Our policy for lost books is everyone has a book go missing now and then, but if a student loses more than two during the year, the student will not be permitted to take any more books home. Library books will have to remain in the student’s classroom. As always, PS166 library books are always welcomed back no matter how long they’ve been missing, so if one turns up at home, on the playground, or in a backpack, just turn it back in. No questions asked!